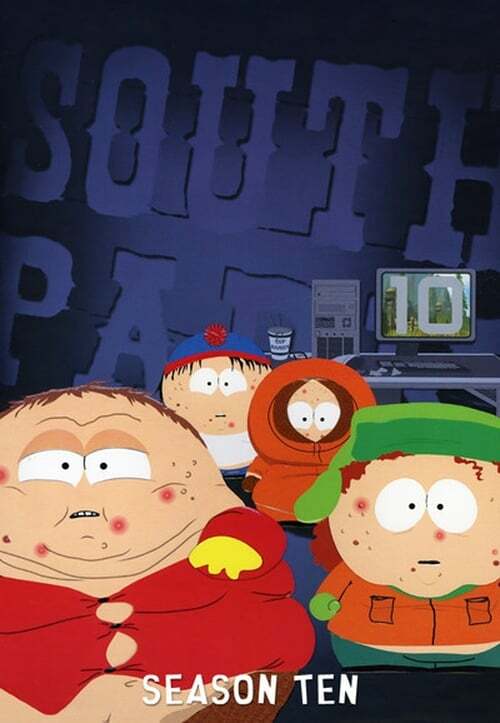 The tenth season of South Park, an American animated television series created by Trey Parker and Matt Stone, began airing on March 22, 2006, and is their favorite season. The tenth season concluded after 14 episodes on November 15, 2006. This is the first season in which Kenny does not die and the last season featuring Isaac Hayes as Hayes quit the show following the backlash behind season nine's "Trapped in the Closet" episode. This season also had a minor controversy when the Halloween episode "Hell on Earth 2006" depicted The Crocodile Hunter's Steve Irwin with a stingray lodged in his chest getting thrown out of Satan's Halloween party for not being in costume. Episode 2 in this season is the last one with the Braniff Airlines logo. This season is also home to the episode, "Make Love, Not Warcraft", which won the Primetime Emmy Award for Outstanding Animated Program in 2007. It's also home to the two-part episodes "Cartoon Wars Part I" & II, which involved Family Guy trying to air an image of the Muslim prophet Muhammad, and "Go God Go" which involved a future world where there was no religion. The season was listed as one of the 20 Best Seasons of the Last 20 Years by Pajiba.